Four females, who received new smart NID cards on Monday, are seen smiling in the city\'s Siddheswari Girls College area on Monday. National ID cards with biometric details are being issued to citizens on Monday after the Election Commission (EC) formally inaugurated it the previous day. On Sunday, President Md Abdul Hamid and Prime Minister Sheikh Hasina received their new Smart NID cards with biometric details. Citizens at Dhaka's Uttara and Ramna are getting their new ID cards after providing fingerprints and iris impressions at two camps. Meanwhile, Chief Election Commissioner Kazi Rakib Uddin Ahmad has inaugurated the distribution at the former enclave of Dashiarchharha in northern district Kurigram. The commission's PR Director SM Asaduzzaman told bdnews24.com voters at sector 1 and 2 of Uttara Model Town are receiving cards from the Uttara High School. The other camp, set up at Siddheswari Girls' College, is distributing cards to residents of Ward No. 6 in Ramna, he said. Authorities have asked citizens to dial 105 to get details of distribution centres and schedule. Voters got their new cards after submitting the old laminated ones and after providing biometric details. Those who registered, but did not receive an NID card, will be required to show the registration slip to receive it. The cards, with a unique 10-digit identification number for citizens, can be used for availing a host of other facilities apart from voting. The EC's NID wing has set up a help desk to answer queries on the NIDS. Citizens have been asked to dial 105. To know distribution date and centre type SC followed by a space then the 17-digit NID number (those with 13 digits must add their year of birth at the beginning) and send to 105. Those who have not received NID yet will have to type SC followed by a space then F another space the form number mentioned at the registration slip followed by another space then D and the birth date in yyyy-mm-dd format and send to 105. The NID wing will let know detail over distribution dates and centres through a reply message. 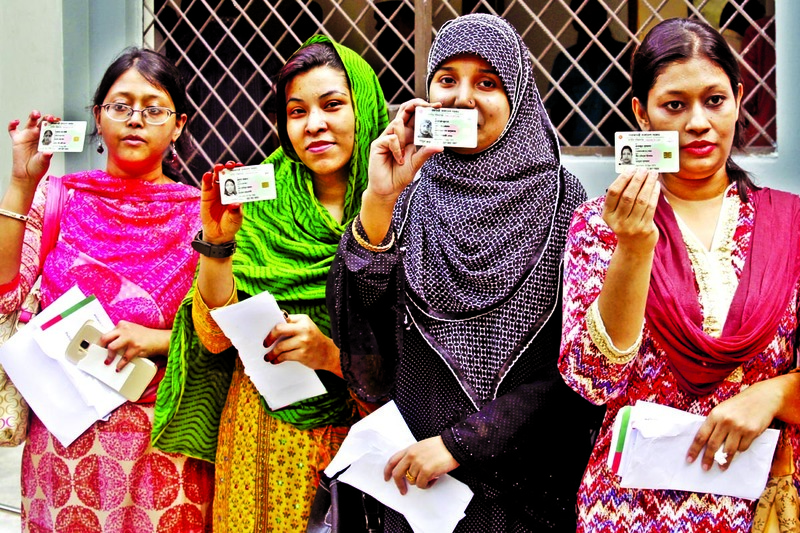 Uttara's Election Officer Mohammed Shahjalal said smart card distribution has started on a trial basis to more than 63,000 voters of ward 1. The distribution will go on in Uttara High School and College from Oct 3 to 22. Ramna's Election Officer Mahbuba Mamata Hena said that voters of Ward 19 can collect smart cards from Siddeswari Girl's High School and College from Oct 3 to 10, from Segun Bagicha High School in Ward 20 from Oct 13 to 20 and from Udayan School in Ward No. 21 from Oct 22 to 26. NID wing Director General Brig Sultanuzzaman Md Saleh Uddin said distribution of smart NID cards will start full throttle across capital Dhaka based on the feedback from these four wards. Distribution of smart cards hit the former enclave of Dashiarchharha in Kurigram where the CEC inaugurated the process in the morning. Primarily, voters of Phulbarhi Upazila will be provided with smartcards. Residents of three unions of the former enclave will receive the cards eventually. EC will eventually cover the whole country after finishing distribution in Dhaka and Kurigram and end the whole process by December. First phase: Two city corporations in Dhaka and Kurhigram. Second phase: Khulna, Chittagong, Rajshahi, Barisal, Sylhet, Narayanganj, Comilla, Rangpur and Gazipur city corporations.